Common vocabularies, data standards, application profiles and ontologies are key in ensuring we can make better meaning and management of the vast amounts of data becoming available every day. To simplify the task of retrieval and using of value vocabularies on support of data representation, there is a number of initiatives creating, curating and maintaining registries. GODAN Action VEST / AgroPortal Map of Standards - - containing 380 value vocabularies (including AGROVOC) of all types and all formats - - is one of them. AGROVOC multilingual thesaurus - available under the international Creative Commons Attribution License (CC-BY IGO 3.0) - considered to be the starting point for any individual or organisation working towards disseminating their agriculture-related work globally. This value vocabulary is maintained by the UN Food and Agriculture Organisation (FAO). AGROVOC is indexed in FAIRsharing, AgroPortal, BARTOC, Dublin Core KOS Relation Vocabulary, VEST Registry, Research Vocabularies Australia, just to name a few. You are wellcome to share YOUR views on AGROVOC through AGROVOC Survey (It should take about 10 minutes). Thank you ! 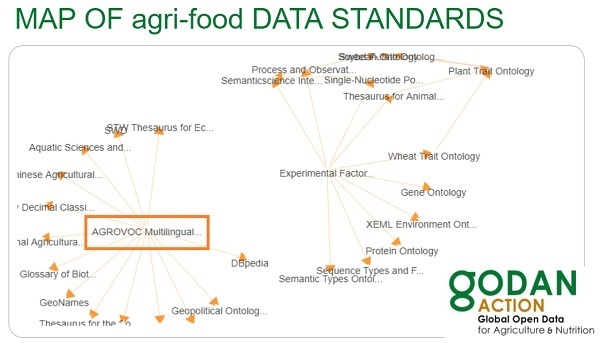 Next to the CAB Thesaurus (CABT), and NAL Thesaurus (NALT), AGROVOC has been also the starting point for the Global Agriculture Concepts Scheme - a global open data repository of interoperable terminological and conceptual information in agriculture. GACS is developed in collaboration among FAO, CABI and USDA. A new expanded GACS Working Group of ag- & data-related institutions (under the umbrella of GODAN project) has been currently defining its plan of activities on how to expand, improve quality and structure, and maintain CAGS. Stay up to date by visiting Agrisemantics website. AGROVOC is part of Linguistic Linked Open Data Cloud (LLOD) which contains critical mass of linked open resources helping manage transdisciplinary data and knowledge and advocate the technology. The LLOD diagram is maintained by the OKFN Working Group on Linguistics. Although not all resources are already available, the group actively works towards this goal, and subsequent versions of this diagram will be restricted to openly available resources. More details on how to add a new data set to the LLOD diagram are here (How To Contribute). The VEST / AgroPortal map is an online database of standards in use for the exchange of agriculture and nutrition data. VEST/AgroPortal Map is the continuation of the AIMS-VEST Registry which now includes metadata from the AgroPortal ontology repository managed by University of Montpellier and Stanford University. Read more about differences and interaction between VEST and AgroPortal. Work on improvements of the VEST/ AgroPortal Registry is currently being conducted under the umbrella of the GODAN Action project, - a support action to the GODAN initiative. GODAN Action involves Wageningen UR – Alterra, the Food and Agriculture Organization of the United Nations (FAO), the Technical Centre for Agriculture and Rural Cooperation (CTA), the Global Forum on Agricultural Research (GFAR), AgroKnow, the Land Portal, the Open Data Institute (ODI), AidData,the Institute of Development Studies (IDS). !!! VEST / AgroPortal team is CALLING ON EXPERTS !!! An expert in Open Data standards. … Click on Contribute: you can register/login (it’s just an access account, we don’t ask for additional information) and once logged in click on “Add vocabulary” under Contribute. … Once logged in you can click on “Claim” on the standard page and explain what your responsibility is for that standard. We will grant you access to edit the description of that standard. … If your standard is defined using a standard vocabulary (RDFS, SKOS) or ontology (OBO, OWL) language, take one step further and upload it to the AgroPortal, a repository of ontologies and vocabularies where advanced functionalities are included. … to help improve the way the map is organiszed and offer better functionalities. For more information on MAP OF agri-food DATA STANDARDS, please use this Contact Form. Share YOUR views on "Ontology Metadata" through a Survey ! A survey about users of VocBench : share your needs with the community !